Now available online is a book penned by karate master Gichin Funakoshi, Rentan goshin toudi jutsu (Toudi arts: Polish your courage for self defense). 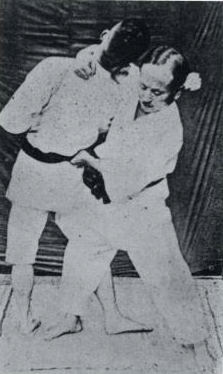 Toudi, or to-te was the term originally used for karate before its codification on mainland Japan in the 1920s. First published in March of 1925, this version is the sixth printing from just thirteen months later. It's a PDF format and in Japanese. There are over 200 photos, and two things I noticed were the high stances which are not a staple of Japanese karate, and nage waza (throwing techniques) that are given short shrift in most schools of karate. This was apparently before Funakoshi, who arrived in Japan in 1922, made some very deliberate changes to the Okinawa-te he learned back home. Funakoshi's style of karate eventually came to be known as Shotokan, a term the master supposedly never used or felt comfortable with. Replete with illustrations, there are no English translations of this book to my knowledge. For more works of this ilk go here.